Pick n' Save Orchard has been a family-owned business serving our customers for over 85 years. Ora Van Deusen planted his first trees in 1925. His Son, Roy Van Deusen , upgraded the orchard with Semi-dwarf trees in the late 60's . Now, Roy's Daughter, Lynn Van Deusen continues the family tradition with the addition of Blueberries, Black berries, Raspberries, pumpkins, chickens and horse drawn carriage rides. Strawberries coming soon! The maple syrup is still made the way it was seventy years ago, using a 12-foot long wood fire stove. We also use our beehives to collect and spin only the finest pure honey to bottle and sell. We even have honey with the comb, which is a treat for the kids. During the season we make apple butter,and jams , all from our fresh fruit. There are over 850 semi dwarf trees and all have been trimmed to a 7-foot height, which make the harvesting much easier. The orchard is all trimmed grass, which gives it a park- like setting. Weekends are a family favorite, hayrides and a horsedrawn carriage (call for an appointment for carriage rides or email Lynn at lynnorchard1@gmail.com to reserve a special event horse and carriage). Children can visit the pumpkin patch and pick their own Jack-o-Lantern. 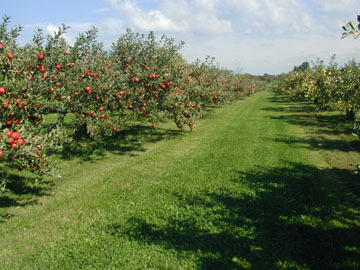 Our customers pick all apples, but upon request we can have apples ready and bagged for sale. All fruit is weighed and sold by the pound. Raspberries and Blueberries are sold in quart and pint containers, also customer picked. Enjoy our newly planted crop of Blueberries.